16 new students from across the MENA region selected to the program, which is co-funded by LAU and MEPI, were the center of attention at a welcoming ceremony. Dr. Walid Touma, director of the LAU–MEPI TL Scholarship Program, said the students are showing their "true colors" as tomorrow's leaders, during a ceremony welcoming the second class of TL students. 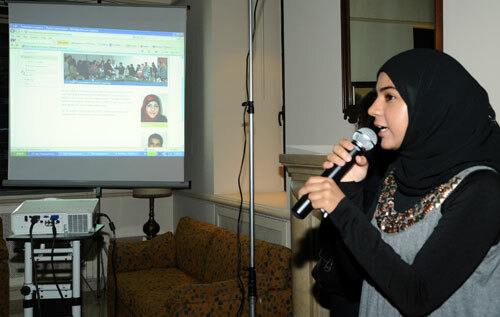 TL student Arzak Mohammed from Yemen gives a tour of the new LAU–MEPI TL website. LAU President Dr. Joseph Jabbra said that leaders like the MEPI TL students are needed today more than ever. TL students presented a short video documenting their adventures and accomplishments since starting the program. The 22 TL students with LAU officers, program administration members, and other guests at the ceremony. 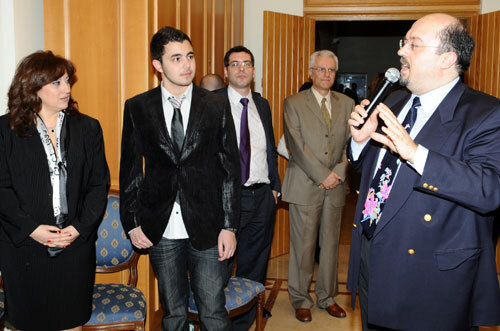 The second class of students from across the Middle East and North Africa studying at LAU as part of the Tomorrow’s Leaders Scholarship Program, co-funded by LAU and the U.S. Department of State’s Middle East Partnership Initiative, were formally welcomed to the university during a reception on the Beirut campus, March 12. The 16 new students, in addition to the six second-year LAU-MEPI TL students that had started the program in fall 2008, used the opportunity to show a short film they produced highlighting some of their accomplishments since entering the university in fall 2009. “I’m very proud of our students,” said Dr. Walid Touma, director of the program, who also heads the University Enterprise Office that has been coordinating the program since its launch. “They are really showing their true colors as tomorrow’s leaders,” he added. After showing their video, the students unveiled the LAU-MEPI TL program’s new website, which features student profiles, news and events, press kits, and other information regarding the program. The students, representing Bahrain, Egypt, Iraq, Lebanon, Palestine, Tunisia and Yemen, are on their way to completing four-year bachelor’s degrees in majors of their choice — most of them at the schools of Arts & Sciences and Business. Their first two years are spent at LAU Byblos, followed by a semester of study in the United States, before completing their final three semesters at LAU Beirut. In addition to their rigorous academic studies, TL students participate in a number of extracurricular and community activities designed to develop them into well-rounded professionals and leaders. The program covers the students’ tuition and housing fees at LAU’s dorms, and provides other benefits, such as a monthly living allowance. Since arriving to LAU, the TL students have earned recognition for their activism, helping out with several campus group events. Their most recent event has been a collaborative weeklong fundraising campaign in February to help victims of the massive earthquake that struck Haiti in January. Several of the TL students explained that the program is helping them transform their daily struggles into the fuel needed to fight for a more just world. It perhaps has something to do with the fact that some of them come from countries where their daily lives are obstructed by war and occupation. “This program has a great combination of leaders, and I hope that together we can reach a plan to create peace in the world,” says Raffoul Francis, a TL student from Lebanon. During the ceremony, LAU President Dr. Joseph Jabbra offered some remarks where he emphasized the importance of training leaders to face the challenges posed by globalization. 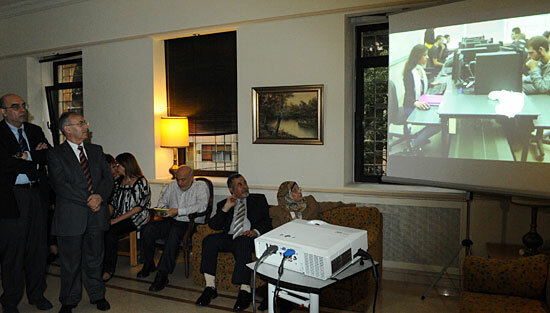 Besides LAU, the program is also offered at the American University of Beirut and the American University in Cairo. “Every year we have a new group of wonderful students,” says Jennifer Williams, cultural attaché at the U.S. Embassy in Lebanon, who helps with the coordination of the MEPI TL program at LAU and AUB.